LaBELLE – As camp director, Martha Pierce has called Riverside Retreat home for 15 years. But she’s putting her faith in God and moving on to another calling in the hills of Tennessee, beginning April 1. She has found a place to live with others who share her devotion to nature and social justice: Narrow Ridge Earth Literacy, about 35 miles from Knoxville. 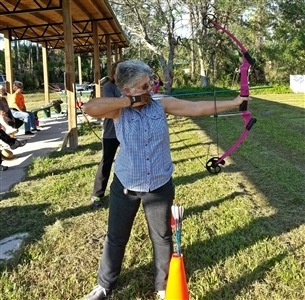 Martha Pierce, director of Riverside Retreat, takes a turn on the archery range. She will be leaving her position April 1 after 15 years. Photo from Riverside Retreat. “I got connected with this (Narrow Ridge) about seven years ago,” Pierce said. “I have been going back and forth for short visits all the time. I went back for a week two years ago in 2013 to celebrate my birthday and returned that year at Christmas and went again in May of 2014. “Narrow Ridge focuses on environmental and social justice and those are my passions,” Pierce said. “I often feel like a fish out of water because I get very intense about those two things and it doesn’t seem that many people do. Pierce said the staff there wants her to help with the children and youth, but she is not clear on what else she will be doing. At Narrow Ridge, individuals lease land for home construction. “I lease the property and will be building an off-the-grid cottage,” Pierce said. “A contractor lays the cement slab for the cottage, places the uprights and the roof. Pierce will have a woodstove for heat. Martha Pierce, right, stands with her daughter, Loena Pierce. Photo from Martha Pierce. "Yes, I will be cutting my own wood and will be investing in a chainsaw,” she said. “I will not have electricity or water from a normal source, not be drawing on any of the regular sources of power, but rather use rainwater and solar power. It will be mostly solar and I will have propane for the hot water tank and stove. Propane will run half the main items – and the solar electricity for a few light appliances and the washing machine." Residents at Narrow Ridge have a community garden and grow their own vegetables. “I will get a couple of goats and chickens when I get there and get settled,” Pierce said. Pierce leaves behind a program at Riverside that, under her guidance, has quadrupled its programming during her tenure. “We have added programming for adults with mental and physical challenges (and) that has been a lifelong dream of mine,” Pierce said. She listed working with children and youth at summer camp and other retreat programs as the most rewarding aspect of her time at Riverside. She has been active in the Florida Conference Creation Care ministry and incorporated animals she cared for at the director’s residence in her youth programs at the retreat. She found new homes for the chickens, ducks and pigs, but her three cats are Tennessee-bound. A fifth-generation Texan, Pierce traveled the world with a husband in the military, eventually settling in Satellite Beach, where she taught Christian education at the air base chapel there and in surrounding churches. After a divorce and a return to Texas, she found Florida to be more comfortable and discovered a home at Riverside Retreat. Her daughter, Loena, lives in Florida. As she prepares to leave, Pierce has bittersweet feelings. -- Brenda Eggert Brader is a freelance writer based in Winter Haven.